The 3rd edition of Tanzania financial service and conference is happening yet AGAIN. This year it will be happening at the Julius Nyerere International Convention Center (JNICC) in Dar es Salaam from Jan 28 to Jan 30, 2019. The exhibition and conference is dedicated to bringing together key players like financial providers, regulators and market experts to interact and discuss the future of financial services such as micro finance, fin tech firms, insurance and banking institutions and partnerships between regional networks. 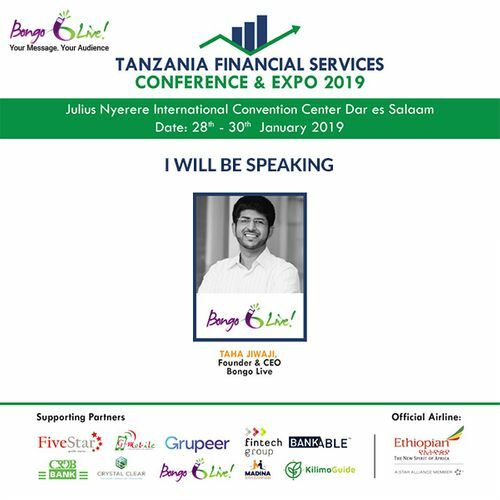 Speaking of key players, our very own Bongo Live founder and CEO Mr. Taha Jiwaji will be one of the high level speakers at the conference and will have plenty to share. The three day conference will highlight ways of develop your business and build your network and will also give you a chance to identify the enormous market opportunities available in Tanzania.